Captain James Cook helped define Alaska in the 18th century by mapping its jagged coastline for the first time. 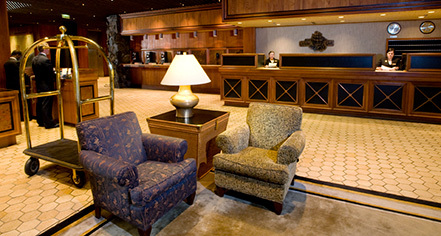 Since 1964, the Hotel Captain Cook has defined luxury in Alaska by offering a level of elegance and comfort unparalleled across the state. The legendary sea captain and the hotel that bears his name share two great qualities: a love of nature and an indomitable, Alaskan spirit. Captain James Cook was a British explorer and cartographer whose three major voyages took him around the southern tips of Africa and South America, to Easter Island and, on his final voyage, along Alaska’s majestic coastline. On these voyages, he and his crew documented the people, animals, and flora and fauna that many had never seen before. In June of 1778, while looking for a Northwest Passage to Hudson Bay, Cook and his crew on the HMS Resolution dropped anchor in Turnagain Arm - within sight of the spot where Hotel Captain Cook stands today. Walter J. Hickel, a Kansas native who arrived in Alaska in 1940 at the age of 20 with only 37 cents to his name, was a longtime Alaskan, entrepreneur, hotelier, author, and served twice as Alaska's governor. His first governorship was as a Republican, from 1966 to 1969. He left office to become Secretary of the Interior under President Richard Nixon and served from 1969 to 1970. His second tenure as governor, from 1990 to 1994, was as a member of the Alaska Independence Party. Hickel was a real estate developer, building and operating hotels, business and shopping centers for decades in Alaska. In 1964, an earthquake leveled much of downtown Anchorage, and many were hesitant to rebuild. 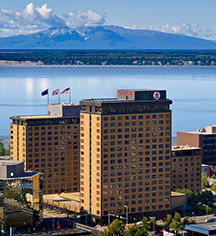 Never one to think small, Hickel reacted to the earthquake by pledging to build Alaska's biggest and best hotel in devastated downtown Anchorage. Hotel Captain Cook was named for the intrepid British explorer who helped define Alaska in the 18th century. The first tower of the hotel opened in 1965; the second and third followed in 1972 and 1978. Today, the 546 guestroom hotel plays host to dignitaries, celebrities, and people from all walks who love the grandeur of Alaska. Hotel Captain Cook combines the access of the natural beauty of Alaska with the modern luxury accommodations that guests today expect. Hotel Captain Cook, a member of Historic Hotels of America since 2016, dates back to 1964.